Everything in this life is a risk. You are given only two options. Take the risk and expect results or don’t take a risk and expect nothing. Stop procrastinating! God uses people who are willing to get out of their comfort zone. He uses people who are willing to take risks. What risk are you facing? A relationship risk, a witnessing risk, a family risk, a business risk, a job risk, a life decision, a medical risk. Whatever you are facing, know that the Lord is with you and He makes it abundantly clear that He will help you. When you are called to step out in faith, realize that your God is greater than any problem. Be still for a second and remember who is in control. Sometimes we make things far worse than what they really are. One night after worshiping outside I decided to jump into the pool. At first, I was hesitant because I knew the water would be cold. I waited a while. I touched the water with my feet. Finally, I said enough is enough and I jumped in. Was it cold at first? Yes! All businessmen have to take risks. No risk no reward. This goes deeper than just business. When we don’t take risks, we miss out on what God is doing in our life. We miss out on seeing God work. We miss out on a testimony. We miss out on a blessing. If you think about it, it is riskier not to take risks. Biblereasons.com was built on a risk and God’s faithfulness. God gave me a promise with this site that I wouldn’t be put to shame and He remained faithful as always. Instead of doing what everyone was yelling at me to do such as “get a job!” I did what God wanted me to do. He wanted me to blog. I was out of work for over a year and now I work full-time as a Christian blogger. Imagine if I would have listened to everyone who was mocking me. I wouldn’t have been able to see the goodness of the Lord. I would have been working at a job I hate instead of a job I love. I wouldn’t have been able to see God’s activity through this site. It’s such a blessing and such a privilege to witness God helping the lives of others through what was once a risk. If God tells you to go do something, then go do it! It’s dangerous to disregard God’s voice when He tells you to do something. Sometimes the risk that God tells us to do is protecting us from something in the future. Sometimes the risk is going to be beneficial to others. Always remember, God knows best. If God has told you to do something, then He is going to lift you up. When you get alone with the Lord and you start knowing His heart, you will begin to be more confident in Him. You will understand God’s love better and once you understand His love, then fear begins to diminish. From personal experience I’ve seen God make a way when there was no way. God always makes a way! Don’t worry about what you don’t have. Don’t worry about not being like everyone else. Just like Moses, Gideon, and other men in the Bible, we like to give reasons on why we can’t do something. “I’m too weak, I’m too shy, I’m not eloquent, I’m too young, I’m poor.” Always remember that God is the one who accomplishes His work through us. We are to be dependent on Him. Who can stop God’s work? God has all the resources in the world and He will provide you with what is needed. You can be confident in your God because you understand His great love for you. Also, for His great name’s sake He will make a way. Imagine if Moses stood at the Red Sea and God did nothing. God gave Moses instructions but He does nothing to help him! The Egyptians would have said, “The God of Moses brought Moses to the Red Sea and did nothing to help him.” For His great name God will be with you and He will help you. Doing nothing doesn’t change your current situation. You will never know if you never try. Like I said before, it’s riskier not to take risks. I talk to a lot of people who have felonies. Some never take the risk and look for a job because they have the “no one is going to hire me anyway” mindset. Some do everything they can to find a job. Ask yourself, who is more likely to find a job, the one who is searching or the one is not searching? When you don’t take risks, you are settling for nothing. You have an opportunity to change your entire future, but what you do next is critical. Just because you are Christian does not mean you have to let people and life run all over you. It’s time to take charge and take a risk! Imagine if Martin Luther King Jr. never took a risk. It’s either you take the risk and at least try or go on with your daily life and do nothing about what you believe that matters. God has given us all different talents and we should all be investing our talents for His glory. When we read Hebrews 11 we notice that so many risks were taken by faith. When you are absolutely sure that God is leading you to do something, then keep your eyes on Him. Don’t trust in your bow or your sword because it is the Lord who saves. Sometimes God is going to tell you to do something that people might not understand. Sometimes we will be asked to come out of the norm. Sometimes we might have to take a lower paying job for Christ. Sometimes we might have to give more than others for Christ. Jesus led Peter to take a risk. Jesus wanted Peter to trust and have faith in Him. By faith Peter started walking on water towards the Lord and it was only until he got distracted that he started to sink. There will always be distractions, but we can have faith in our God to act on our behalf. There is a quote that says, “if God brings you to it He will bring you through it.” We always think that we have strong faith until a situation arises and we need to exercise that faith. Taking risks by being vulnerable and opening up. There are going to be times as a believer when you are going to have to be vulnerable. God might lead you to open up and share something that is going to be a blessing to others. Sometimes we should share our faults and struggles. God wants you to share testimonies, not keep them to yourself. Also, sometimes God might lead you to lovingly tell someone what they need to hear. For example, sometimes we have to open up and tell people what they are doing is offending us. Share your ideas and your opinions. Don’t be quiet all the time. Sometimes you have to take a risk and express yourself. Godly men in the Bible had one thing in common. They all took risks. In today’s society men are not acting like men. Men are acting weak and feminine and we are seeing the consequences of it. Men are not standing up for what they believe in. Many people are involved in weed smoking, sexual sins, homosexuality, drunkenness, voodoo and witchcraft, greed, and more. Who else is going to stand firm to God’s Word to bring people to the knowledge of the truth? Why are we compromising with the world? Men are afraid to preach the gospel, which results in more people going to hell. Men do not want to risk rejection so they never find a wife. Men are afraid to discipline their children, so their children grow up to be ungodly. Men are to be leaders. It’s a shame to be a coward! Be a man and do what needs to be done! Love causes you to do crazy things. Love always results in action. Love has caused many people to be martyred for their faith. When you love God, you put it all on the line for Him because you know that He is worthy of it all. Sometimes love causes you to be put in uncomfortable situations. Sometimes love causes you to put your safety at risk. Love results in selflessness. Instead of thinking about yourself, all you can think about is, “they’re in trouble and I have to help. It’s not about me it’s about them.” Think about it. Don’t you remember when love caused you to do crazy things, either for the Lord or for others? Always remember God’s past faithfulness. Whenever fear is hindering you from trusting in the Lord with something He wants you to do, then remember His past faithfulness. If God has done it before, He will do it again. Don’t allow Satan to cause you to think that past testimonies were a coincidence. Think back on how faithful He’s been to you. Ask God to allow you to see what He’s done in your life. Maybe in the past God has given you special verses to remind you of His faithfulness. Take a look at those verses. God is not a one hit wonder. A believer will never stop seeing the goodness of the Lord. 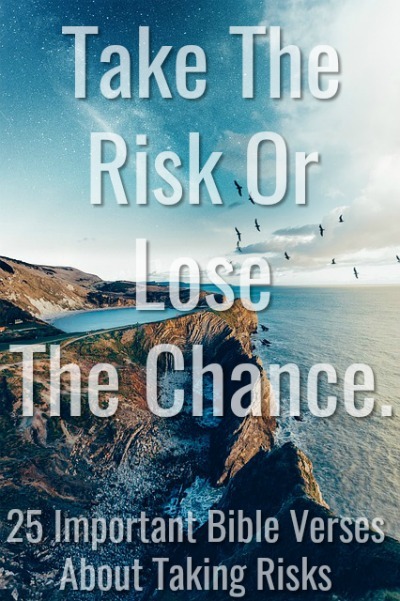 When it comes to taking risks, you can either lose or you can gain. There is a time to take a risk and there is a time not to take a risk. We have to use discernment. It is dangerous to try to force God to work in our activity instead of us being involved in His activity. We should never say to ourselves, “God you didn’t stop me so I guess this is your will.” I must admit that I’ve been guilty of doing this in the past, but now I know better. This can easily lead to going astray. Just because an opportunity opens does not mean that we shouldn’t ask for God’s guidance. The Bible says to trust in the Lord, not yourself. If we carelessly do our own will, we can create a storm in our life that was never there. Before any big decision we must seek the Lord diligently. We must get alone with Him and hear His voice. We must examine our heart and check to see, are we being led by ungodly motives? Never try to force God to do your will! God involves us in His activity, not the other way around. Next: Is Making Out A Sin?